Law Offices Strode and Edmunds Krine[?] Building Lynchburg, Va. November 6th, 1924. Aubrey E. Strode J. Easley Edmunds, Jr. Dr. Arthur H. Estabrook, Hyden, Ky. My dear Dr. Estabrook:- Your letter of the 3rd. inst. saying that you could come to Amherst for the trial of the Carrie Buck case on the 18th inst. 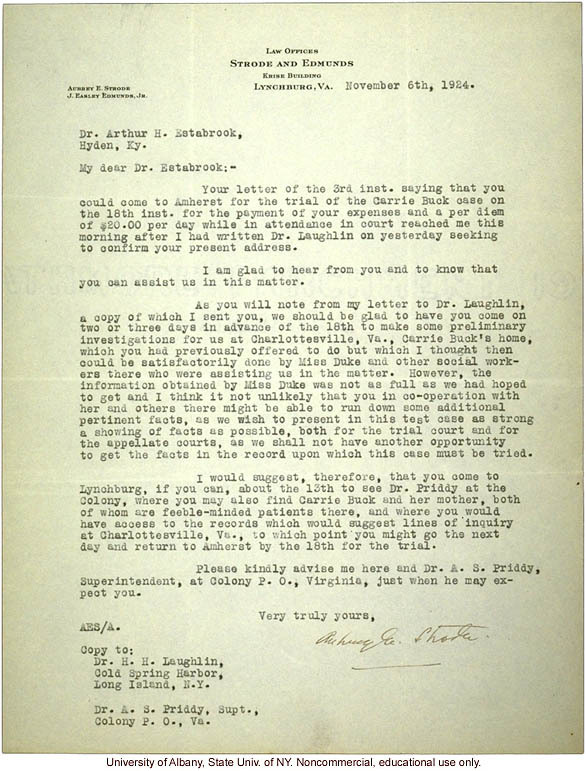 for the payment of your expenses and a per diem of $20.00 per day while in attendance in court reached me this morning after I had written Dr. Laughlin on yesterday seeking to confirm your present address. I am glad to hear from you and to know that you can assist us in this matter. A you will note from my letter to Dr. Laughlin, a copy of which I sent you, we should be glad to have you come on two or three days in advance of the 18th to make some preliminary investigations for us at Charlottesville, Va., Carrie Buck's home, which you had previously offered to do but which I thought then could be satisfactorily done by Miss Duke and other social workers there who were assisting us in the matter. However, the information obtained by Miss Duke was not as full as we had hoped to get and I think it not unlikely that you in co-operation with her and others there might be able to run down some additional pertinent facts, as we wish to present in this test case as strong a showing of the facts as possible, both for the trial court and for the appellate courts, as we shall not have another opportunity to get the facts in the record upon which this case must be tried. I would suggest, therefore, that you come to Lynchburg, if you can, about the 13th to see Dr. Priddy at the Colony, where you may also find Carrie Buck and her mother, both of whom are feeble-minded patients there, and where you would have access to the records which would suggest lines of inquiry at Charlottesville, Va., to which point you might go to next day and return to Amherst by the 18th for the trial. Please kindly advise me here and Dr. A. S. Priddy, Superintendent, at Colony P.O., Virginia, just when he may expect you. Very truly yours, [signed] AES/A. Copy to: Dr. H. H. Laughlin, Cold Spring Harbor, Long Island, N.Y. Dr. A. S. Priddy, Colony P.O., Va.